Here’s another worthy example in support of my long-standing argument that oatmeal cookies are a legitimate breakfast item. An argument with whom, I’m not exactly sure, since my husband totally backs me up on this and my kids turn a blind eye. I suppose it’s an imaginary disagreement with those phantom people out there. My good friend Dawn always urges me to list them by name for her, these disapproving folks, which really takes the wind out of my sails. I hate it when she does that. How I am supposed to please them if they only exist in my mind? 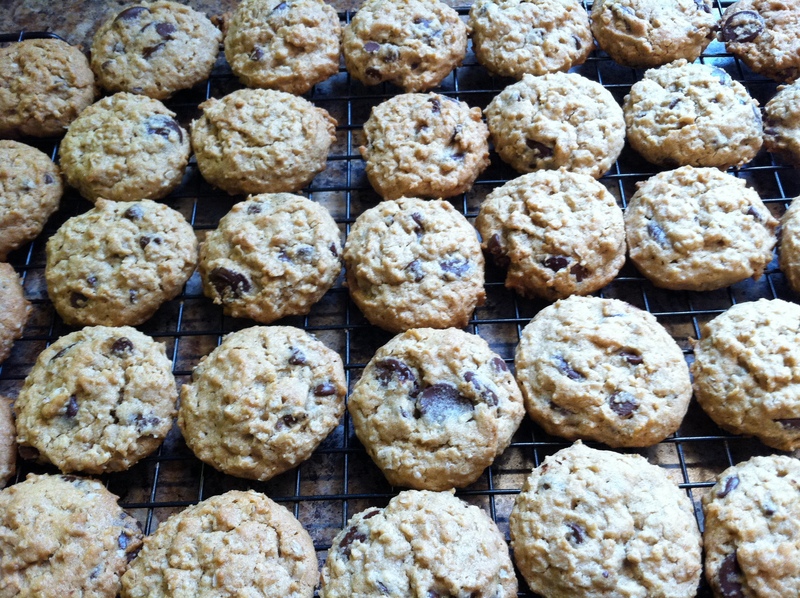 Usually my breakfast-caliber cookies are made with oatmeal and some variety of dried fruit. These are even better. Oats? Fiber — check! Peanut butter? Plant-based protein — check! Dark chocolate? Antioxidants (and a host of other wonderful health benefits) — check! Only 4 tablespoons of butter for thirty-some cookies? I’ll take it! I baked these to bring up to my elder son who is attending college 200 miles away. I figured he might appreciate some cookie love, particularly as he’s recovering from a dislocated knee and has to navigate an alternately icy and slushy campus while using a pair of crutches. My husband and I taste-tested the cookies (for breakfast, naturally) on the drive up north, just to be sure they were okay for our darling boy’s consumption. If you would like to join me in my Oatmeal Cookies As Breakfast movement (or if you just want to bake some cookies), here’s the recipe, from King Arthur Flour. To maximize the healthy awesomeness, I substituted a mixture of Ghiradelli 60% Cacao Bittersweet Chocolate Chips and Ghiradelli Mini Semi-Sweet Chocolate Chips (heavier on the former) for the milk chocolate chunks in the recipe. Vive la révolution!